Nick Burcher beat me in highlighting a great advert in the press from Sure, following the success of the England team in the 2nd Ashes Test. In particular the use of Andrew Flintoff and listing his 5 wickets followed by "No Sweat" is brilliant. 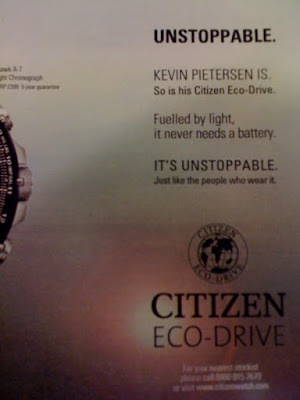 Citizen (the watch maker) currently has Kevin Pietersen as their cricket celebrity endorser. So it is of no surprise to see an advert in today's Shortlist featuring his image. 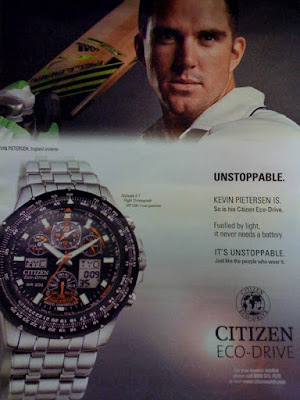 However, following the news over the last few days that confirms that Pietersen shall not be taking any further in the ashes, it is a tad unfortunate that Citizen decided to describe him as "Unstoppable" (just like his watch! ).